Grips display as small colored squares at key-points on selected entities. Whether grips display or not and the appearance of grips is controlled through a series of grips settings. When the display of grips is turned on, grips can be dragged using the mouse in order to stretch, move, mirror, rotate or scale entities. 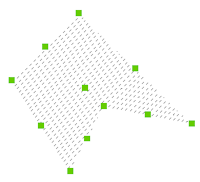 When the GEOMRELATIONS system variable is set, the geometric relation (perpendicular or tangent) of the entity being edited with crossing or nearby other lines, polylines, arcs or circles is indicated (see Geometric Relations). The Copy option of the grips editing commands allows to create multiple copies of the entities being edited. To select a grip, move the mouse over it, then click. Selected grips display in a different color, which is defined by the HOTGRIP system variable. A selected grip is called a hot grip. By default hot grips display in red. The midpoint grip on lines and infinite lines, the startpoint grip on rays, the center grip on circles, arcs, ellipses and elliptical arcs, the grip on points and the insertion point grip of texts, mtexts, blocks and Xrefs can be used to quickly move such entities. When DRAGSNAP is ON, dragged entities display at the current entity snap location. Select all entities you want to edit. Press and hold the Shift key, then click the first grip. The selected grip displays in red. Keep the Shift key pressed, then click more grips. All selected grips display in red. Release the Shift key, then click the hot grip you want to use as the base point. The hot grips move simultaneously. Prompts you to specify a new base point, other than the selected grip. Copies the selected entities and keeps the originals. By default, multiple copies can be created. Press Enter to stop making copies. If the Copy option is chosen, deletes the latest copy. (Applies to Grip Rotate only) Allows to specify a reference angle. Type the angle in the command bar or specify two points. Aborts the grip edit command. The grips editing commands can either be chosen by repeatedly hitting the space bar or the Enter key or in a context menu. Select the entities you want to manipulate, then drag one of the grips. Select the grip or grips you want to manipulate. Click the grip you want to use as the base point. All selected grips move simultaneously. Enter the coordinates, then press Enter. Key-in the distance, then press Enter. Use ORTHO or Polar Tracking to control the angle. Click the grip you want to use as the base point for the move. The Grip Stretch command is launched. Right click, then select Move in the context menu. Hit the Space bar or Enter key to cycle through the Grips Editing commands until Move is active. Choose Copy in the context menu. Type C , then hit the Space bar or Enter key. 7. Repeat the previous step to create more copies or press the Space bar or Enter key to stop. Click the grip you want to use as the base point for the mirroring. Right click, then select Mirror in the context menu. Repeatedly hit the Space bar or Enter key to cycle through the Grips Editing commands until Mirror is active. The GRIP_MIRROR prompt box displays. You are prompted: Enter second point: Base point/Copy/Undo/eXit. 5. Specify a second point to define the mirror axis. Click the grip you want to use as the base point for the rotation. 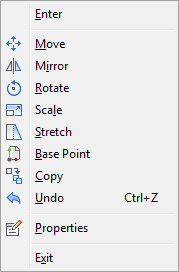 Right click, then select Rotate in the context menu. Repeatedly hit the Space bar or Enter key to cycle through the Grips Editing commands until Rotate is active. The GRIP_ROTATE prompt box displays. You are prompted: Enter rotation angle: Base point/Copy/Undo/eXit. Specify a point to define the rotation angle. Click the grip you want to use as the base point for the scaling. Right click, then select Scale in the context menu. Repeatedly hit the Space bar or Enter key to cycle through the Grips Editing commands until Scale is active. The GRIP_SCALE prompt box displays. You are prompted: Enter scale factor: Base point/Copy/Undo/eXit. 5. Type the scale factor in the command bar, then press Enter to scale the selection.